There are many soaps and body washes that you can use to wash your face. However, they may not be specially formulated for the face, and they may leave your skin feeling dry. To avoid harsh ingredients found in many skin cleansing products, you can choose the best natural face wash listed from our top 10 choices. When you’re shopping for skincare or beauty products, you may wonder what is considered natural. It seems like the words natural and organic are sometimes used interchangeably, but they do have different meanings. Unlike "organic," the term "natural" is not regulated, and neither is "vegan" or "green." Any product can be labeled natural by its manufacturer. Buying a face wash labeled as natural does not necessarily mean it is free from the same harsh chemicals that are in regular products. That’s why it is so important to read the labels on the products you buy. If you want a face wash without parabens, fragrances, sulfates or toxins. Read the label of everything you buy and learn which ingredients you should avoid. While your skin can absorb some of the ingredients in face washes and other skincare products, the amount is in dispute. Some experts on natural products claim that as much as 60% of what you put on your body is absorbed through the skin. However, dermatologists claim that statistic hasn’t been proven, and it could be far less than 60%. If you want a natural face wash, check the ingredients on the label. Some experts say to avoid parabens, phthalates, and sulfates to be on the safe side. They know research may not show that these specific ingredients are harmful, but why take a chance when you can avoid it? When finding products for our top choices for natural face washes, we researched products and chose those are labeled as natural. We tried to choose products with no parabens, fragrances, phthalates, and sulfates to use as our top picks. In addition, we read testimonials from people who had bought these natural face washes and then created a star rating system for those we chose. The rating system is from one to five stars, with five being the best natural face wash. Here are our top 10 choices in this category. A milky cleansing treatment that gently removes buildup for radiant, healthy looking skin. Best for dry, dull, or sensitive skin. These ingredients are organically grown, and the essential oils are clinical grade, so they are safe to use on your face. 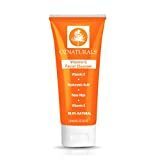 Not only can you use this cleanser to wash sensitive skin, but it is okay to use on chapped or irritated skin as well. This product will also minimize the appearance of skin pores while leaving your face feeling more supple and soft. This natural face wash from Tree to Tub is made with organic soapberries, which includes five to 12 species of trees and shrubs in the lychee family. The berries of these plants contain an ingredient called saponin, which is a natural surfactant. The cleanser foams, so it glides smoothly over skin and helps to balance its pH to 5.5. It has natural anti-bacterial and anti-inflammatory properties, and it is unscented, so your skin won't be irritated by fragrances. It is suitable for use by both men and women and those living a vegan lifestyle. The cleanser is cruelty-free and made sustainably as well. 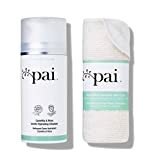 Pai Skincare cleanser is a certified organic product that can be used to not only clean skin of everyday dirt and grime, but it is safe for removing makeup, including eye makeup. It is a hydrating formula that can be applied to sensitive skin to help cleanse it. Among its ingredients is green tea that cleanses skin and contains several antioxidants and vitamins. It includes Omega 3s and Vitamins A, B, C & E. It also contains Rose Otto, which allows skin to stay hydrated. The cleanser is available in two sizes, 3.4 and 6.8-ounce bottles. Included with the cleanser is a muslin cloth that can exfoliate your skin and free it from dead skin cells to freshen its appearance. You get one cloth with the small bottle and two with the larger size. 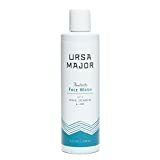 This facial cleanser is made to help men’s and women’s skin stay hydrated, clean pores and diminish their appearance, and reduce breakouts. Since it is made with Vitamin C and Organic Aloe, it has several antioxidant benefits for facial skin. It can rejuvenate your skin’s appearance and help fade any discolorations on your face. It can also help reverse any sun damage from free radicals due to being out in the sun too long without wearing sunscreen or sunblock. The cleanser is suitable for all skin types, it helps reduce the appearance of wrinkles and fine lines, and it prevents premature aging. It is designed in Florida and made in California, so it is an American product. Instead of purchasing the Vitamin C cleanser, they also have a natural Glycolic cleanser that is available. It does not contain any harmful preservatives, parabens or alcohol. This cleanser is 98.3% percent natural. The company backs their products with a 100% money back guarantee if you’re not satisfied with it within the first 30 days. This natural face cleanser is made to help all skin types get clean without stripping the skin of its oils and drying it out. Made with honey, coconut milk, Vitamin E, and Jojoba oil, it is formulated to keep skin hydrated even as it deep cleans pores. The properties of its natural ingredients maintain the skin's elasticity, reduces wrinkles, smooths skin and repairs damage from the sun. This product is made from sustainable sources, it is cruelty-free, and it contains both natural and organic substances. If, after you buy and use this facial cleanser, you’re not completely satisfied with it, you can return it to the manufacturer for a full refund. It is made in the United States. Instead of a cream, lotion or foam, this face wash is a gel. Along with washing away dirt and grime, the gel contains ingredients to gently exfoliate your skin without stripping it of moisture. It contains over 36 natural ingredients like sugar cane to brighten skin, rice seed that moisturizes it, and coconut surfactants to help clean it. It also contains lemon to gently exfoliate and brighten skin and white tea that provides antioxidants that will help make your skin healthier. Some of the ingredients it does not contain include parabens, sulfates, fragrances, and petrochemicals. This cleanser is suitable for vegans, it is cruelty-free and gluten-free. Men and women with any skin type can use this cleanser every day for cleaner, brighter looking facial skin. 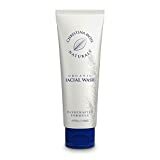 Christina Moss facial wash is formulated to be gentle on skin, so people with sensitive skin can use it. It is made to improve the condition of the skin on your face. It is made so it won’t strip skin of moisture, it doesn’t dry it out or leave any build-up on it. It contains certified organic ingredients, as well as 100% natural ones. As it cleanses your face, it helps to battle acne and blemishes without causing your skin to be oily. No matter the users' age, their face may feel rejuvenated and fresh after using the cleanser. The packaging is environmentally friendly since it is biodegradable. The company guarantees its product will stay pure and fresh for up to six months and if you’re not completely satisfied with it in that time frame, you can return it to the manufacturer for a replacement or a full refund. Fantastic quality product from a great brand. Pure botanical cleansers lather away toxins and impurities for fresh, bright skin. This Avalon cleanser is made with Vitamin C to refresh your skin while washing away the dirt and impurities on your face. The Vitamin C helps to repair the damage due to stress and damage caused by the sun and exposure to the elements. As the cleanser washes your face, it fights the signs of aging, like fine lines and wrinkles, and helps your face regain its glow. Not only does it contain Vitamin C, but it also has lemon bioflavonoids and white tea that provides antioxidants that fight damage done by free radicals. The gel turns into a creamy lather that feels good on your face as it repairs your skin. You have the option of buying one bottle or a two-pack of the cleanser when choosing this product. Now you don’t need multiple bottles of cleanser in the shower with you because One Love Organics' Easy Does It does it all by washing your face, body, and hair. It cleanses the skin pores on your face as it protects the skin all over your body and your hair from environmental damage. It contains natural ingredients like apple extract, apple oil, honeysuckle flower extracts, and Saponaria bark extract. Saponaria is a flowering plant that is also called soapworts. It is a natural, gentle soap made from the flowers and stems of the plant. The product is cold-pressed to yield the best results for its users. If you’re in the market for the best natural face wash, you need to read the label of any cleanser that claims to be natural. A natural face wash should contain botanicals to cleanse your pores without drying your skin or stripping the oils from it. Look for natural oils like olive oil, rose hip oil, or shea butter to keep skin hydrated. Also, look vitamins to help restore your skin. Vitamins A, B, C, and E can provide antioxidants that will protect your skin from damage from the sun, windburn and the pollutants in the air. If a product claims to be organic, look for the circular seal that states “USDA Organic,” which is usually written in green or black. A cleanser that claims to be natural will not have a seal because “natural” products are not regulated, which is why you need to read the list of ingredients. Also, avoid the ingredients that are listed above, such as parabens, synthetic fragrances, phthalates, and sulfates when buying face washes and other skincare products. By being observant and reading labels, you can find a natural face wash that will cleanse your skin, keep it hydrated and help your face always look its best.